Natalie Cook takes Marlena Got Nicd to the WCRHA Green Reiner title. CORNING — The weather tricksters were at work during the first West Coast Reining Horse Association first affiliate show of the year held March 2-4 at the Equestrian Center at Rolling Hills Casino in Corning. California reiners don’t get to show in snowy weather too often, but the snow that was predicted on Warm Up day, thankfully, did not materialize. In fact, rainy weather held off during the show days and visited only during the night time hours, much to the relief of the exhibitors. A special, educational treat for the exhibitors was a talk on Osphos and its uses by Jessica Morris. Judges Ollie Griffith and Pete McAlister judged a full range of NRHA Reining classes as well as a variety of AQHA approved Reining and Ranch Riding classes. Starting the show off on the first day was the Open slate. With a score of 73.5, Mike Boyle, showing Elizabeth McHugh’s Chics Dream, earned first place in the Open, closely followed by David Hanson on Stephanie Munzinger’s Aces High Whiz with a 72.5. With scores of 71.5, the top two placings in the Intermediate and Limited Open classes were shared between Ollie Galligan showing Margaret Daly’s Gunnachicya and Warwick Schiller showing his own Shine Spook Shine. Chics Love Chrome and rider/owner Patricia Eckhoff rode away with first place in the Primetime Open with a 71 score. Lavonne Sturgeon and her beloved California Shines won second with 68.5. Cody Rowe swept the Rookie Professional class by capturing three of the top four placings! He took first place honors with Larry Pearle’s Electric Kit with a winning score of 70.5. Cody, on Richard Boer’s Dreamin About Wimpy, tied for second with Kaity Sotomayor riding Julie Beach’s Spook N Cody with scores of 70. 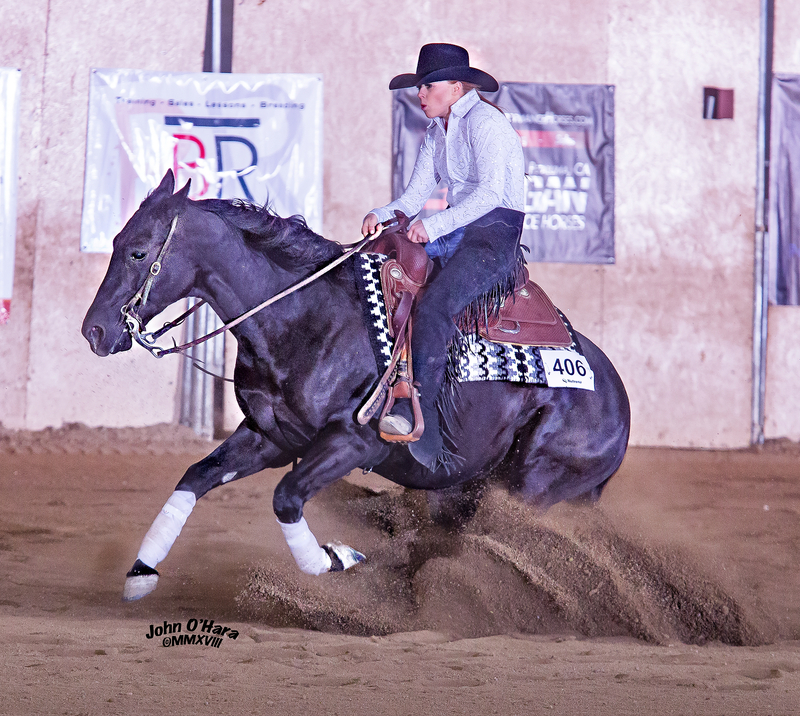 Finishing up the Open section was the AQHA Open Reining, featuring 17 entries. Chics Dream and Mike Boyle took the class. Ollie Galligan showing Gunnachicya tied for second with Martin Padilla, on Tobyann Faingold’s Spangled Desire. With the onset of the afternoon, the Rookie and Green reiners took to the arena. Paige Pastorino and Taylor Made Magnum won both Rookie Level 1 and 2 with a score of 71. 70.5 earned West Coast Hick and Randy Engler a second place in Rookie 1 and a tie for second in Rookie 2 with Mercedes Shiningstar ridden by Margaret Munro. Randy also won Primetime Rookie. Sharing second, with scores of 70, were Laetitia Loubser and her Coronas In Hollywood and Michele Auzenne and her Oakanic. In the WCRHA Green Reiner class, Natalie Cook rode Marlena Got Nicd to the win with a score of 69.5, with Kelly Staley and Star Trek Tag coming in second with a 68. Lisa Dentoni, riding Mr Twister Whiz, won the AQHA Amateur Level 1 Reining. Since a lot of reiners are adding Ranch Riding to their repertoires, the WCRHA club decided to support those interests and are offering a variety of ranch riding classes to their shows this year. Kaity Sotomayor extended the trot, jogged over poles, and more to garner three of the top five placings in the AQHA Open Ranch Riding class. Riding Catamia Oak, owned by Mary Mendoza, Kaity won the class with a score of 77. Paige Gentry on her Nu Steppin Shoes was second with 73. In the AQHA Amateur Ranch Riding, Stacy Hamilton on her Californya Girl rode to first with 74 and Ginger DeGrange on her TR The Big Easy was second with 70.5. For the more mature exhibitor, the AQHA Amateur Select Ranch Riding class provided Derek Brummett and his palomino mare, Thischicsamistress, the format for a win with a score of 76. Michele Auzenne and Oakanic earned 73.5 for their efforts to place second in the class. The AQHA Amateur Level 1 Ranch Riding, for the less experienced in this venue, was won by Aces High Whiz and Stephanie Munzinger with second going to Colleen Morris on Out West In Levis. Margaret Chancellor showed Dunnit With A Shine to a score of 72.5 for the win in the AQHA Youth Ranch Riding with Baily Alexander on Ima Ugly Stick coming in for second with 71. The WCRHA Ranch Riding All ages was won by Kelly Staley on Star Trek Tag with a 73. Mari Hess and her Steppin Up Haidas took second with a 72. All in all, the ranch riding classes were well received and enjoyed as something a little different! A brisk morning ushered in the second day of competition with the NRHA Green reiners. Sharing first place honors in the Level 1 were Elizabeth Atkins on Almighty Chic and Margaret Chancellor on Dunnit With A Shine, both with scores of 69. Paige Pastorino riding Taylor Made Magnum topped the scoreboard in Level 2 with a score of 69.5, with Elizabeth Atkins taking second on her Almighty Chic. First place in the Snaffle/Hackamore 5 & Under went to Miss N Wimpy, owned by Barbara Morlan and shown by David Hanson, scoring 72.5. Darkestsideoftheboon, earning the second place award with a 71.5 for owner Jill Cenedella, was ridden by Ron Emmons. With a 71.5, Patricia Eckhoff topped the Non Pro board with her Chics Love Chrome by taking home first places in Non Pro, Intermediate NP, Limited NP, Primetime NP, and AQHA Amateur Reining. Congratulations, Patricia! Debi Murnan and her Jacs Red Pine earned second places in Non Pro, Intermediate NP, and Primetime NP with 71. Placing second with 70.5 in Limited NP was Elizabeth McHugh showing Chics Dream. Co-first places in the Masters NP were awarded to Lavonne Sturgeon showing California Shines and George Deffterios showing Great Banjo, each scoring a 69. Carla Odetto on Wimpchester 73 and Elizabeth McHugh aboard Chics Dream shared first place honors out of a field of nine in the AQHA Amateur Select Reining, both with scores of 70.5. A fun, unique competition, open to all exhibitors who felt “lucky,” was held Saturday evening—Battle for the Saddles. A roll of the dice was added to each exhibitor’s reining score to determine who would win a saddle in the Non Pro class as well as the Open class. Kain Emmons rolled the dice and, for the second year in a row, won the saddle for the Open division. How “lucky” is he? Britta Jacobsen added her dice roll to her reining score to win the saddle for the Non Pro division. A special thank you to Rolling Hills Casino for sponsoring the two saddles. There was something for everyone as all 21 exhibitors left with gifts and goodies sponsored by HorsLic, California Embroidery, Caboy Hattery, Equine Oasis, and The Show Pad & Michelle Miola. Another brisk, yet sunny, morning welcomed the Green As Grass horses and their riders to the pen on the final day of the show. Mackenzie McDowell and her Timber Winner emerged as winners, scoring a 71. Coming in second was Paolo Troia-Cancio on his grey mare Suga Suga with a 69.5. Finishing off the show were the Novice Horse Non Pro and Open classes. Splitting first place in the Non Pro Level 1 were Britta Jacobson riding her Ms Benz and Mari Hess showing her Steppin Up Haidas, with scores of 71.5. Besting a class of 19 entries in the Non Pro Level 2 was Ken Hamilton on his Hollywood Voodoo with 72. Sharing second place were Jacobson and Hess. In the Novice Horse Open Level 1, Mike Boyle came in first and second respectively on Pamela Hurst’s Rock N Roll Baby with 72.5 and the McLeod Family Farms’ A Gun Show with 71. Martin Padilla rocked the very competitive Open Novice Horse Level 2 class with a 74.5 to win first on Spangled Desire for owner Tobyann Faingold.